High winds tore roofs off buildings and knocked out power in Grayslake, amid a bout of severe weather that swept across the Chicago area Sunday night. 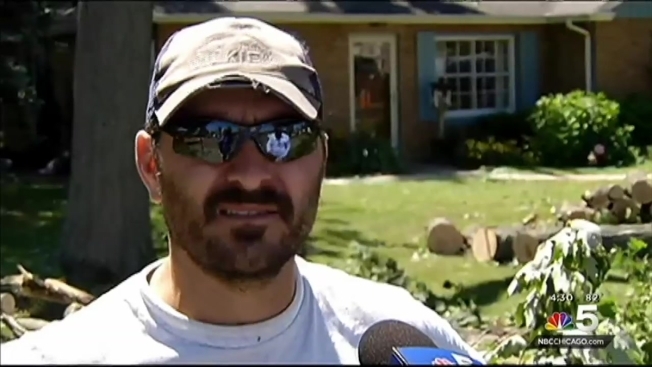 The storm cut a 5-mile path through Grayslake, according to Fire Chief John Christian, who noted that it is not yet clear if the damage is the result of a tornado. Several businesses were damaged, as well as Grayslake Central High School, which had its roof partially torn off, prompting officials to close it down until further notice, according to a statement on its website. "Storms passing through Grayslake Sunday evening have caused damage to Grayslake Central High School. The building and District offices will be closed until 10:00 am Monday, August 3rd, until emergency services has evaluated the situation," the message said. "The school and grounds are closed until further notice. Updated information will be posted on the District and school website as it becomes available." More than 18,000 people across the Chicago area and northern and western Illinois were left without power as of Monday morning, ComEd reported. Reports of damage in Grayslake came as other severe weather warnings for the region expired. The National Weather Service canceled a tornado warning for Lake County shortly after 9 p.m. Sunday. A Severe Thunderstorm Watch for several counties across Illinois—including Cook, Kane, DeKalb, LaSalle, McHenry, Will, Lee Winnebago, DuPage, Henry, Kankakee and Lake counties—expired at 2 a.m. Thunderstorm warnings for Cook and Lake counties in Illinois and Lake County in Indiana also expired. Sky 5 footage captures storm damage in the Grayslake area. The warnings were issued after a violent storm swept through the Chicago area Sunday afternoon, leading to at least one death and an evacuation of Lollapalooza. Following temperatures in the low 90s all weekend, a cold front passed through the Chicago area Sunday evening, bringing the renewed risk for severe thunderstorms and heavy rain. Lollapalooza was evacuated briefly due to the severe weather in the afternoon, and festival organizers ended the event in Grant Park about 30 minutes early due to the evening storms. The earlier storm left one man dead and several others injured after a tent collapsed at a family festival in suburban Wood Dale. A dome at a ballpark in Rosemont also collapsed, but no one was injured in the incident. Large hail was seen across the Chicago metropolitan area with winds in excess of 50 mph reported near O'Hare Airport. Across Lake and McHenry counties, there were several reports of funnel clouds and a waterspout northeast of North Chicago over Lake Michigan. Mayor Rahm Emanuel toured damage from the storms in the city's Rogers Park neighborhood Monday. Emanuel said 39 pieces of heavy equipment, 14 semi-trucks and more than 150 crew members from the Department of Streets and Sanitation were deployed to respond to the 853 "tree emergencies throughout the city." The department also planned to put out 10 garbage trucks Monday to pick up any remaining tree debris. Crews from the Department of Transportation were also working to address downed light poles and street lights. “From constant communication to consistent coordination between city departments, Chicago has been responding to the aftermath of last night’s storm with the full force of city resources to keep our residents safe, our street and sidewalks clear and our city on the move,”Emanuel said in a statement. The rest of the week looks much cooler and drier, as temperatures drop into the 70s. Over the course of the week, the area could experience a 20-degree temperature drop, from a high of 92 degrees Sunday to a predicted high of 72 degrees Saturday. There are no thunderstorms in the forecast for the remainder of the week, but there is a chance for showers on Thursday.